What makes Mount Sizer a must-see? Check out Baychic’s pictures from Saturday. She went with a group that put in a 16-mile version of the Sizer loop (just about any Sizer hike is a minimum of 12 miles, all of them arduous.) The hills burnt by last year’s fire are starting to green up, and the terrain has that rugged wildness you have to be in the middle of to appreciate. I’ve covered the Sizer loop twice here (April 2008 and February 2007), both on the so-called counter-clockwise route. Baychic went the harder way, to my mind: the brutal uphill slog on the Hobbs Road Short Cut; it’s almost as bad downhill but it’s a soul-killing climb up — no fun at all. Whichever way you go, though, just go; if not now, try in the spring, when the hills are green (though the trails will be muddy). That’s assuming you can handle 12-plus miles and 4,000 feet of elevation gain. Give yourself plenty of time, take along extra food and water, slather on sunscreen. Take a map along in case you take a wrong turn. The best way to go? I stand by the counter-clockwise loop: Corral Trail to Manzanita Point Road to Poverty Flat Road, across the Coyote Creek (wading or boot removal usually required) and up to the Jackass Trail, where you turn left and head up the ridge to Blue Ridge Road, which you take till you turn left at Hobbs Road and return to the Park HQ. Jackass Trail is the key on this route: you can find it much more readily from Poverty Flat road than you can coming in the opposite direction off Blue Ridge Road: Baychic’s group missed the turnoff (the sign burned in the fire, most likely) and added a couple extra miles to their hike. Jackass Trail is one of the nicest segments of single-track at Coe, especially now because it tracks right through the middle of the fire zone. Haunting and stark as of this writing, but highly recommended pretty much anytime but July or August. Random Curiosity does the clockwise route. Fedak includes Sizer in one of his crazy-long day hikes. Calipidder did a 17-mile version of the clockwise loop. A Flickr slideshow of my Mount Sizer pics. Google terrain map because I like doing these. I remember having this discussion before, and I’m sure I’m not alone in preferring to go up Hobbs than go down it. If I’m ever going to slip and fall on my derriere it’ll be on a steep downhill. A good leg burn is something all hikers need at least once in a while. Just be sure to eat plenty of protein and hydrate well. My wife has fun doing it because she always tries to beat me to the tall bench. She usually just forgets to tell me that we are competing. I round the bend and she’s sitting on the bench eating dried fruit and informing me that she beaten me again. My “Short Cut” uphill experience is limited to a 95-plus day in August, the worst possible time to climb it, so I’m probably overly biased against that route. 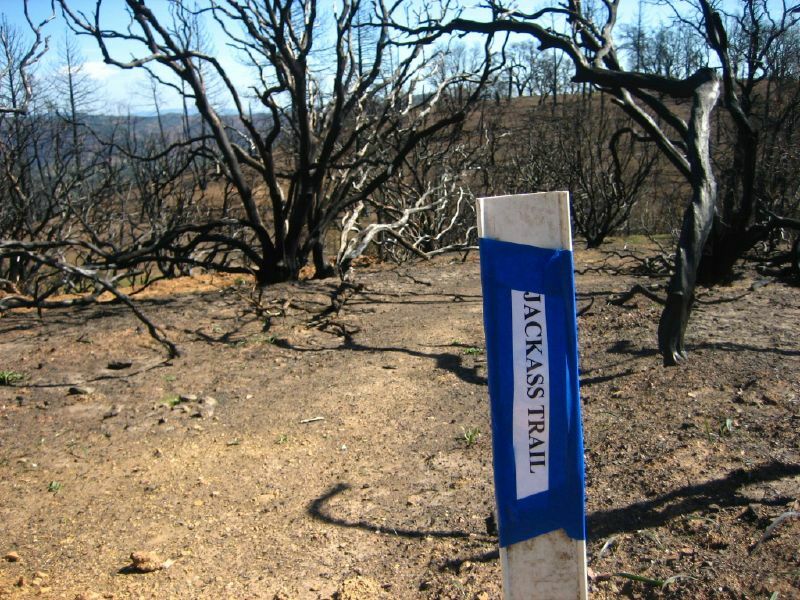 The risk of missing the Jackass Trail turnoff appears to be much greater after the fire, though. Either way the Short Cut has to be experienced first hand. We did this hike in May 2004 as our last training hike before hiking Half Dome over Memorial Day weekend. The two hikes are close in distance and elevation gain/loss. We did the clockwise route, so we had to go UP the “Short Cut”. I never ever want to do anything like that again. We all took a good long rest – lunch time! – once we arrived at Mt. Sizer. There had been a temporary trail marker that was put up after the fire, but on a more recent trip I remember it was gone. The original sign was always being ripped off because people like the name jackass. Many years ago on my first mountain bike ride at Coe we did Sizer in the clockwise direction. Basically it was bad the whole way – but a great trip! You climb that “soul killing” hill that you mentioned before you get to Sizer, but after a big descent from Sizer I recall another big and long climb back up from a creek bottom to the visitor center. This is killing me. Now I am going to have to go climb this beast again!